This blog intends to focus on some primary elements and factors considered while conceptualizing Contemporary Styled buildings. Read through this article to understand about modern architecture and simple spaces. Contemporary Architecture focuses on large and clear spaces rather than adding unnecessary design elements which would essentially clutter the usable spaces. Plain simple and whole spaces are preferred which increases a sense of vastness or volume. Any differentiation of spaces is rather created by levels or forms rather than closed rooms. Simplicity of the elevation increases the elegance and gives uncluttered and classy appearance. Usage of limited materials and colors also increases the appeal of the elevation. The simplicity of the plan is reflected in the elevation. Open kitchen, dining are designed to be a continuation of the living room, giving wide and easy circulation areas. Contemporary architects prefer straight or angled lines and geometric shapes in most elements like windows, doors, openings, floor plans or even forms. Curved lines are also used in some cases if it is relevant to the overall language of the building structure. This library by Zaha Hadid architects gives a perfect example of how the windows and openings are arranged to accentuate the form of the building as well as give aesthetic value by using repetitive lines. This contemporary residence combines the use of windows, pathway, columns and the swimming pool to create geometrical shapes in all X, Y and Z planes. Houses have extended roofs at one or multiple sides and at multiple levels which gives an illusion of complex structure. Sky lights, vaults or pergolas are also added to bring about design variation. Here, the vertical window openings are used to break the monotony of the blank wall. 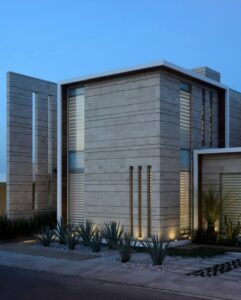 The stone cladding and surrounding landscaping adds a notion of strength to the building. All roof slabs have been extruded to highlight the geometry of the building. This is often coupled with bold colors or cladding on the roof lines on ceiling to bring about the distinction between walls and roof. Contemporary architecture often features large openings to allow maximum light, ventilation and openness in the design. These are also used as design element while Floor to Ceiling length windows or open able French doors are used to accentuate more public spaces. Commercial spaces are enhanced by using form-based glass facades and double height atriums. windows and openings as design elements by use of contrasting colors. interesting features on the façade. Floor plans usually tend to have open halls and kitchens and are only divided by difference in levels, materials or colors. These sunken living rooms have caught on the trend and are being used in most modern designs. The usage of internal walls is minimized to a very great extent allowing maximum light and also better interconnectivity between all areas of the building. Steps leading to a lower level living room creates an interesting and sophisticated look. The projecting slab looking over the living room from the First floor gives visual clarity and easier communication mode. The simplicity of materials and color adds a look of elegance. The concept of courtyard or internal landscaping provides green relief in the house. Commonly used spaces such as dining room, living room, study, etc are directed towards the green area which is either open to sky or uses sky lights. Various styles of landscaping like miniature Bonsai gardens, Zen gardens, pebbles, cacti or perennial plants are used to enliven the spaces. Incorporating water body, greenery and earthen colors creates tranquil spaces and cuts the monotony of concrete structures. Internal or external courtyards integrated with living/dining spaces provide a refreshing look for the spaces. Contemporary style of architecture focuses mainly on clarity rather than complexity of design. Therefore, the materials and colors used are simple or earthy. Extensive glass of wood and glass is combined with rough stone claddings. Colors used are mainly shades of grey or white though individual design may demand a varied usage of materials and colors. A typical example of usage of contemporary materials to create rustic features. Materials in Contemporary architecture does not necessarily mean absence of colors but maintenance of simplicity or thematic designs rather than a clutter of unrelated materials.